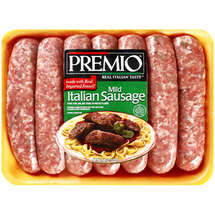 If you become a fan of Premio Foods on Facebook, you can get a B1G1 Free coupon for Premio Sausage — and it doesn’t expire until 12/31/10! Once you become a fan, look for the Wall Post dated Wednesday, December 23rd, to get the link…..or just head right here and print one out for yourself. And don’t forget to join the KC Penny Pinchin’ Mama Fan Facebook page while you are there!